Surgical tables comprise one of the first requirements of a modern healthcare system and thus are likely to be in constant demand over the near future. The global surgical tables market has benefited significantly from the rising investment in the healthcare sector across the world regardless of the economic state of the country. Developed countries have led the way in modernizing their healthcare sectors and incorporating major technological advances, but healthcare agencies in developing regions such as the Middle East, Japan, Asia Pacific, and Latin America are also likely to become major players in the global healthcare sector. This is likely to drive the global surgical tables market at a steady rate in the 2017-2022 forecast period. The increasing acknowledgment of the need to improve the surgical area to maximize its utility and comfort is likely to drive the global surgical tables market. Geographically, North America is likely to be the leading contributor to the global surgical tables market in the coming years. The North America market is driven by the steady rise in demand from the surgical tables market in the U.S., where the healthcare sector is highly developed. 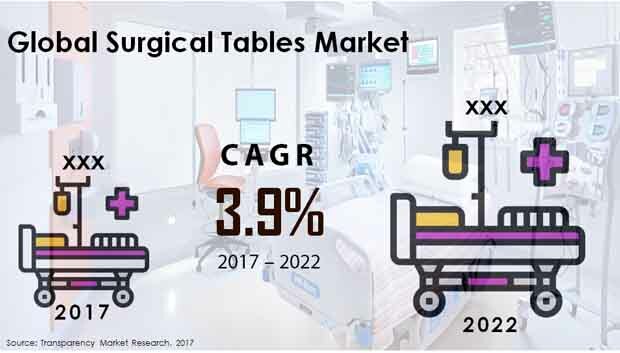 The North America surgical tables market is expected to rise to a valuation of US$301.5 by 2022, expanding upon its 2017 valuation of US$246.9 mn at a strong CAGR of 4.1% between 2017 and 2022. Despite the dominant role of Western countries in the technological development of the healthcare sector, emerging countries such as China, India, Thailand, Indonesia, Malaysia, Singapore, Brazil, Argentina, the UAE, and Saudi Arabia are likely to be vital to the global surgical tables market in the coming years. Several of these countries house rapidly growing healthcare sectors that are receiving significant government funding as well as private investment. This has enabled steady growth of the growth of component industries such as the surgical tables market. The increasing spending power of healthcare agencies in these regions is also likely to lead to growing demand for surgical tables and other such hospital implements. Developed countries such as the U.S., the U.K., France, and Germany are home to flourishing surgical tables markets that are likely to undergo smooth growth in the coming years due to the steady backing for healthcare innovation in the region. Widespread regulatory support for incorporation of technological advances in the healthcare sector is likely to help the surgical tables market achieve steady growth in Europe in the coming years. Despite being likely to lose some BPS over the forecast period, Europe accounted for 27.8% of the global surgical tables market in 2017 and is likely to remain a dominant contributor in the coming years. By end use, hospitals are likely to dominate the global surgical tables market. Hospitals have been the conventional leader in the surgical tables market and are likely to exhibit steady growth in demand over the coming years. Nevertheless, ambulatory surgical centers (ASCs) are becoming an important part of the healthcare sector in developed countries and are likely to contribute consistently to the surgical tables market in the coming years. Key companies examined in the report include AMTAI Medical Equipment, Inc., Allengers Medical Systems Limited, C-RAD AB, Getinge AB, Skytron Inc., STERIS, Elekta AB, Span America Medical System Inc., and Stryker Corporation. New players could also enter the surgical tables market in the coming years due to the lucrative opportunity on offer in the market, leading to intense competition. New players are finding it difficult to gain a foothold in the global market for surgical tables on account of the stronghold of their well-entrenched international counterparts. The latter, with the massive resources they command, are coming up with advanced products every now and then to up the ante against their rivals. Electric surgical tables, advanced operating tables, and electro-hydraulic operating tables are some such superior products they are seen working on to cater better to the needs of patients. Besides, they are also offering end-to-end service to retain customers. Smaller local manufacturers, with limited capital, are finding it tough to innovate technologically superior surgical tables and thereby provide a challenge to the market heavyweights. Despite it, however, there are numerous players operating in the global market for surgical tables making it extremely fragmented. Overall, the market for surgical tables holds out a lot of promise in both developed and developing regions. While the developed nations of Germany, the U.S., the U.K., and France already have a thriving market, emerging economies of India, China, Thailand, Malaysia, Indonesia, Brazil, Argentina, Saudi Arabia, and the UAE are no less in contributing to demand, particularly of technologically advanced products. Serving to catalyze growth in the global market for surgical tables is the supportive healthcare policies framed by the governments of various nations. Those include subsidies provided on drugs and other healthcare devices alongside provisions for inexpensive treatments of patients in state-owned hospitals and clinics. Besides, increasing number of private and public healthcare centers and the growing ability of people to spend on quality treatment facilities is also positively influencing the market. Apart from that, the rising pool of elderly highly prone to different ailments that often require surgeries, rising instances of chronic diseases, and alarming rise in the number of accidents is benefitting the market for surgical tables too. Constant upgrading of equipment by hospitals, ambulatory surgical centers, and other treatment centers to improve efficacy is another growth driver. Hospitals are the dominant end use segment in the global market for surgical tables that would likely expand their leading share further in the next couple of years. Ambulatory surgical centers form another prominent end use segment, particularly in the healthcare sector in advanced nations. From a geographical standpoint, North America at present leads with maximum share in the market for surgical tables on account of the numerous state-of-the-art healthcare centers in the region. Europe is another major market which is likely to rise at a healthy pace in the next couple of years. This because of the strong policy and financial support provided by the governments of most countries and the presence of numerous companies producing medical devices in the region. In terms of growth rate, on the other hand, Asia Pacific is expected to outshine all other regions. Japan is one of the steady contributors to the revenue in the region. In order to examine the competitive scenario in the global market for surgical tables, the report profiles players such as Allengers Medical Systems Limited, Span America Medical System Inc., C-RAD AB, Skytron Inc., AMTAI Medical Equipment, Inc., Elekta AB, Getinge AB, Stryker Corporation, and STERIS.